Despite not being bookshops, the number of shops selling books is increasing. 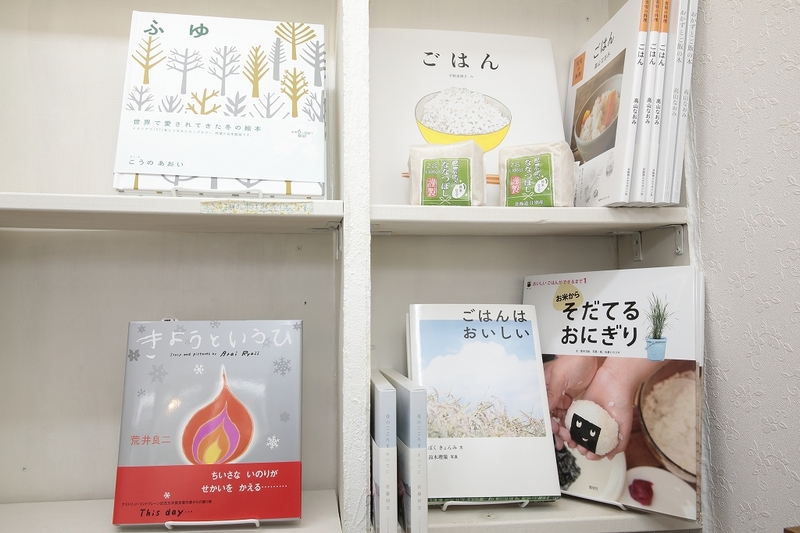 We spoke to Ozaki Mihoko about her activities as a book coordinator linking shops and books. 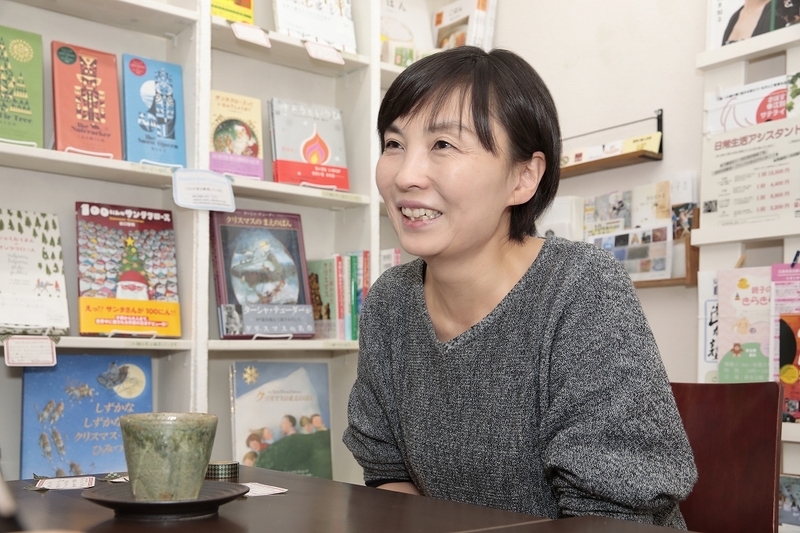 Ozaki introduces herself as a bookshop proprietor who doesn’t have a shop. Originally from Ibaraki Prefecture, after graduating from university, Ozaki began to work for a publisher in Tokyo and used to visit bookshops in her leisure time on the way home from work. One day, someone from the publishing company said, “Books are difficult; even if you print them, you can’t sell them.” That’s when Ozaki thought she wanted to sell books. In 2001, at the age of 25, Ozaki moved to Sapporo and began to work for a publishing company. Ozaki’s aim was to open a shop in 10 years’ time. However, as that time approached, she began to have reservations. She was married and had become a parent. In 2010, she decided to quit her job – not to open a bookshop, but to spend more time with her family. Six months after quitting her job at the publisher, Ozaki thought that if she was going to open a bookshop, this was the time. However, she neither had the capital nor the knowhow. Company start-up seminars, in which she participated occasionally, provided the chance. Proper investigations revealed that in order to open a bookshop, a contract with an agency would be required to distribute books from the publisher, and a deposit was necessary depending on the size of the store. Ozaki consulted with an agency in the hope of being able to purchase supplies without a deposit. “I was looking for a method that was unusual, and managed to find one,” says Ozaki. The response was indeed exceptional, and it’s quite possible that Ozaki’s passion helped to influence the organization’s decision. 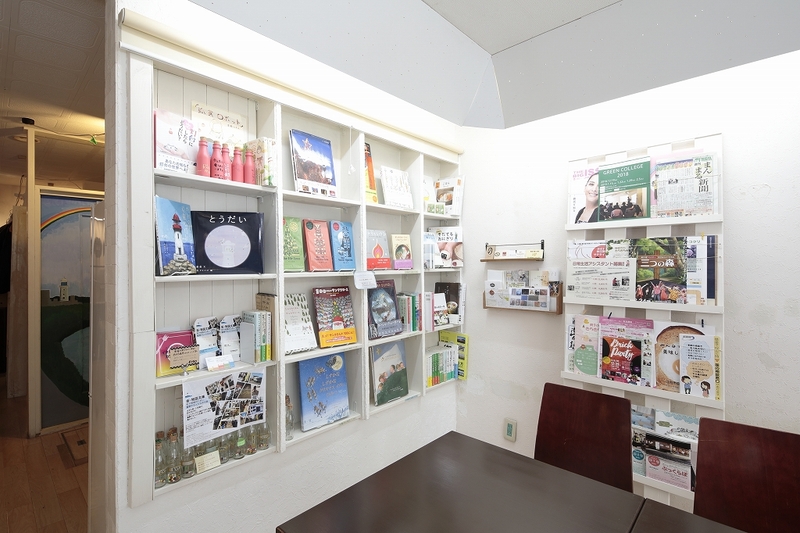 Ozaki was able to purchase books; the next problem was how to sell them. A clue came in the form of the activities of book directors and book coordinators in Tokyo. By selecting books on a theme requested by a client, and creating a distinctive section in which to display them, it’s possible if only a sales area can be identified. 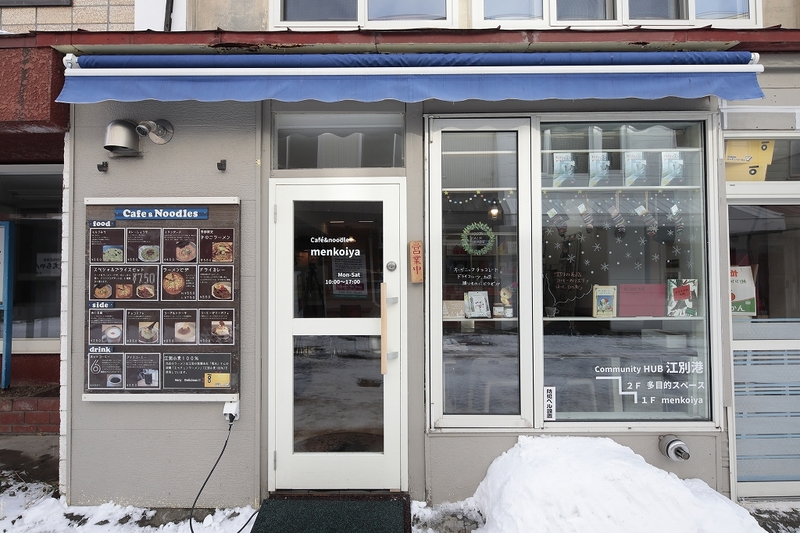 Ozaki was further encouraged by Kusumi Kuniharu of the Kusumi Shobo bookshop, which existed in Sapporo at the time. “I asked his advice about being a bookshop proprietor without a shop, and he thought it was a ‘great idea’. I’ll never forget when he said ‘it’s no good for a vendor of books to just sit and wait’”. Kusumi passed away due to illness in 2017, but his words of encouragement remain in Ozaki’s heart today. Ozaki began her activities as a book coordinator in 2011. Her first job involved the sale of books and tea utensils at a general sundries store. By displaying drink-related books she was able to sell them, but there was a book café kind of feeling and so subsequently more focus was placed on improving exhibits and POP displays. Another challenge was the business card books. 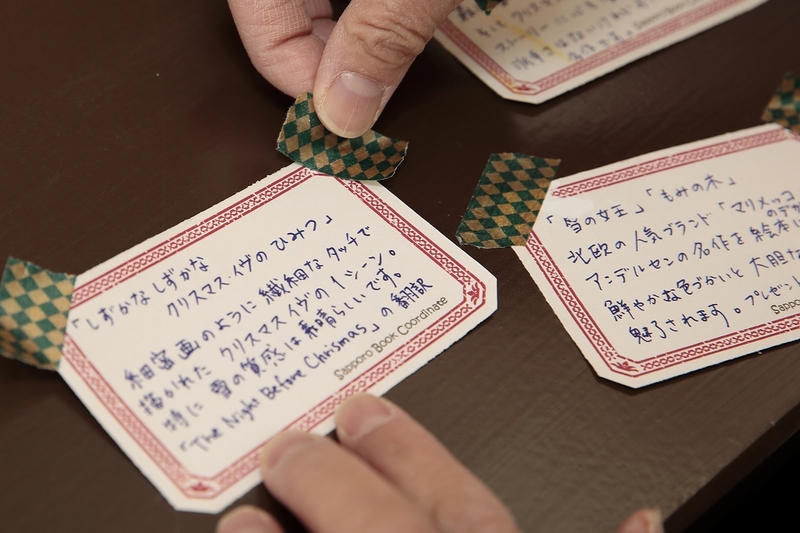 “This business card is fictitious; I made it in the image of a character in a book,” said Ozaki. She proposed them after being requested by Menkoiya, who wanted give books as gifts to commemorate the graduation of university students who were regular customers. 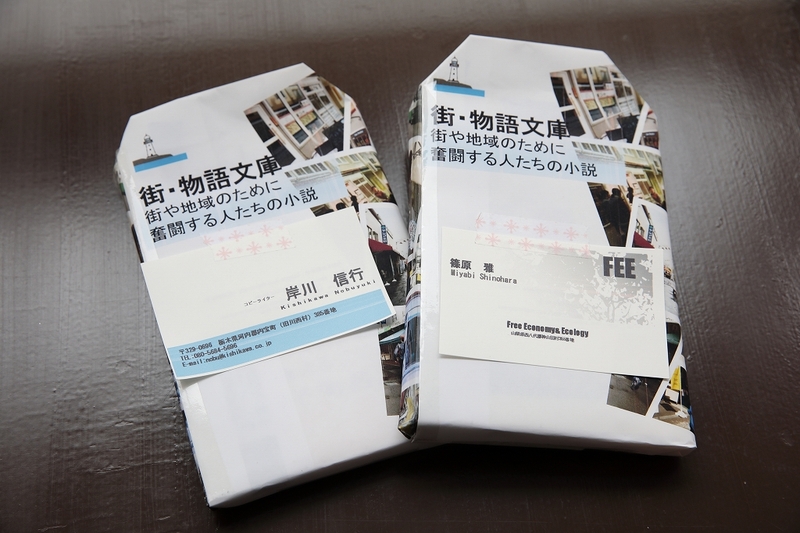 They are “blind books” that they select without seeing the title or author, and are made in the form of business cards on the concept that new graduates will start to use such cards when they start work. Business cards were prepared for approximately 40 work-related novels, and the shop and students loved it.